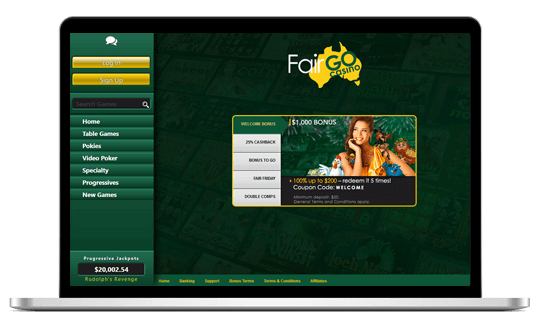 Fair Go is a fairly new Australian casino online that offers Aussie players a taste of Realtime Gaming products with an Australian flair. The Aussie market is extremely important for many online casinos, so it comes as no surprise that there are many new casinos on the Internet that are specifically targeted at our market. But, with so many choices out there for players from Oz, it’s tough for a new casino to stand out. A new online casino needs to be good…..really good. So, does the Fair Go online casino stand a chance in the extremely competitive Australian market? Let’s find out. Fair Go Casino starts off with a bang, with unrivaled welcome bonuses offered to online players. The most noteworthy bonuses offered by the casino site is the welcome bonus, which offers new players tons of perks for signing up. Added together, their bonuses on Fair Go Casino combine to equal an amazing AU$1000, all available as part of the sign-up bonus. The bonuses are split over five separate deposits, with online players being able to claim five 100% deposit bonuses up to AU$200. The minimum deposit amount is AU$20, but we like how easy this welcome bonus is to understand. That’s not all! There are also some other special promotions, besides the excellent welcome bonus running. These promotions include a cashback offer of up to 25% , up to 50% deposit bonus if you deposit $200 for mobile users and double complimentary (comp) points in specified games. Not only that, players get free spins on Fridays for anyone who made a deposit from Monday – Thursday. The Fair Go website is a little vague on whether support is available 24/7, but the good news is that it is. No matter when you have an issue, the team at Fair Go Casino will be ready to assist. Another letdown though is that there doesn’t appear to be any live dealer table games to enjoy. Live dealer games have become very popular in recent years, so it’s a bit of a shame that Fair Go Casino doesn’t offer any to its players. The minimum withdrawal is $50 for Neteller and Skrill, while bank transfers and Bitcoin require a $100 withdrawal or more. As for the maximum withdrawal limit, it isn’t stated on the banking page, but it sits at $10,000 per week. bonuses and promotions. The only real downsides are the boring visual design of the casino and the lack of live dealer games. Besides these two small issues, we were very happy with our time at Fair Go Casino. We feel confident in giving it a very good four out of five spades!